I’m building a boat in my back yard. It’s a Godzilla 25 mini-tug designed by Sam Devlin. View my other site at Zoomatron.com. 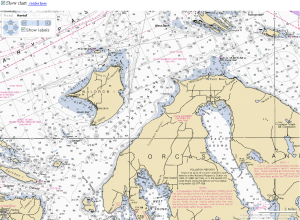 View nautical charts on the web (and other assorted weirdnesses with Virtual Earth). I’m very interested in your project. Although I plan to build a Mal Low 21′ Tug. Do you have the construction of the hull somewhere on your site? I couldn’t get to it, or maybe it’s just me? anyway, looks like you are doing a fine job. https://boatbuild.wordpress.com/page/4/. I followed the Sam Devlin book and plans very closely, and the hull went together pretty quickly. One additional thing I did was to mark _every_ line and location on both sides of all the panels before they went together. These came in handy later on. I looked at the Mal Low tugs, but decided they had a little too much ‘character’ even for me, although I really like the Powder Puff’r design with the open space forward of the pilothouse. What material are you going to make the hull from? Thanks for the info, I was going to buiild in steel, but I’m a woodworker and have built several cold- molded boats so I’m going to build in ply/ epoxy. the hull shape is very similar to what I’m going to do with the Mal Low design. You’re doing a terrific job, the craftsmanship really shows. I’ll be following your progress. My tent is 11 1/2 feet high to the peak. That leaves almost 3 feet over the pilothouse. Any less room, and it would be difficult to finish the top. I’m embarrased to say I have no design drawings. At each step where I deviated from the plans I made a mockup of the structure in the boat, tweaked the dimensions for a few days, and then built the actual parts. The main departure from the plans is the stern. I made the outboard well run from the stern to station #5. The outboard actually mounts to the #5 bulkhead, tripled up. I can take some measurements if you want. Of course, I have no idea how this will work. Sam Devlin is a little concerned about how well it’ll turn. I may need to add skegs. Are you building a Godzilla? I’m always happy to answer any questions about it. Just wanted you to know how much I enjoy and appreciate your blog. 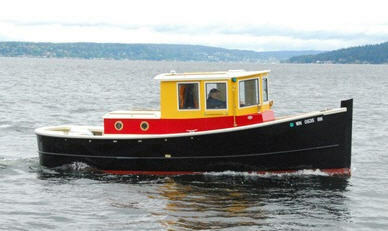 I am presently building a Bolger Champlain – an outboard powered, 22 foot trawler. Sleeps 2, enclosed marine head, full galley, standing headroom, stich and glue. It’s neat watching how you’ve solved problems. Re: your sliding doors. I’m wondering about the hardware and I’m not sure how to best go about it. I’ll watch for your solution. An 8 foot beam would be challenging with this boat if you want an interior like mine. With the side decks, the pilothouse is barely wide enough for 2 seats and a narrow passage to the bow and stern. I put an athwartships bed in the aft cabin, which would be impossible if it were any narrower. If you’re making it as a day boat like the 22, the narrower beam would probably work fine. I’d suggest mocking up the interior to scale with cheap wood and cardboard before making the decision. Let me know if I can help you in any way with your build. It’s been a great boat so far. I just came in from my Sunday morning trip in the rain with a cup of coffee and the Sunday paper. Thanks Tom I,ve sent Sam Devlin an e mail but he has not responded, I will keep trying.In the mean time do you have any study plans or similar that I could look at. What a great site. Truly inspiring. I had a question after starting to read your blog. You mentioned that you made the bulkhead supports on the strongback end at the deck level to save some wood and work. 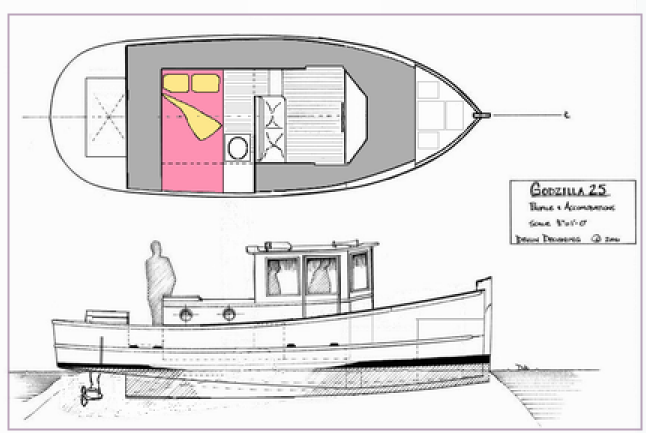 If the original plans called for the bulkheads to continue all the way to the gunnels, how would they have been adjusted for the deck height once it was flipped over? And are you happy with the outboard configuration? Hey Dave, I’m glad you’re enjoying the blog. Bulkhead question: I don’t know. All I could think of was I’d need to chop them out with a Skil saw after flipping the hull. Marine ply is so expensive I really didn’t want to do that. Making them short worked fine, and maybe let the gunnels achieve a smoother sweep as I built them up. Outboard question: I really like it outside the cabin. Quieter, less smelly, cleaner interior, and a much easier installation. I had to add some weight up forward to counterbalance the weight further aft (and the big hole I cut in the stern). Thank you Tom for a great site and for documenting your project in such great and loving detail. I’m a big fan of Sam’s boats, but at the moment, all I have is one of his Oarlings. I have thought for quite some time now that the Godzilla 25 might be the design for me and my wife to putter along the Inside Passage (we live in SE Alaska… Skagway). Before I even saw your project, I thought that the Honda 60 HT was a perfect match… glad to know someone else thought so as well 🙂 But because of where I intend to operate the boat (remote with no help nearby), I’m concerned about redundancy and would like a “spare motor” should it be necessary. I was wondering if maybe twin Honda 20s would fit back there in the same space as your 60, and if the required cutout(s) would not be too much. Do you have a feel for this at all? Hey Mike, there’s a chance I’ll be taking the boat up your direction in the summer of 2013. Maybe I could take you for a spin 🙂 If you get serious about the project and come down to Seattle, I’d be happy to take you out for a ride. No, I really don’t think you could fit two motors back there without harming the design. The 20s are each just a few inches narrower than the 60 so the additional cutout width would really mess with the trim. As it is, I had to add 300 pounds of lead up forward to bring the bow down, and it’s still a few inches high. Making the hole wider would remove the storage space and the walking area too, both of which are really nice to have. I store the spare gas cans, propane tank, fenders, and docking lines back there. I also don’t like twin motors in general (theoretically anyway – I’ve never actually had them). Twice as much maintenance for less total power. You’d need to run them at close to wide open throttle all the time to get the same speed as the 60 at 2/3 throttle, which would be harder on the motors, and probably louder and with additional vibration. The 60 at cruising speed has a nice, low, quiet sound and not a lot of vibration. I also like having the additional power available if I ever need it. I’m thinking of getting a 5 HP Honda as a kicker for the Alaska trip. I’d store it in a bracket up in front of the pilothouse, or maybe on top of the aft cabin. I’d have a bracket to attach it on the well just behind the main motor. With a little thought, you could probably make a linkage to the main motor so it would turn when the motor turns. It’s 60 pounds, so you could mount it single-handed. I’m guessing it would push the boat at 3 knots. This would be a great Alaska boat. We just got back from a 3-day trip, where it rained constantly, winds up to 20 knots, and ice on the gunnels in the morning. Sounds like a standard Alaska summer weekend from what I hear. We were warm, dry, and comfortable the whole time. Thanks for the reply Tom. I thought having twins back there in the well would be a bit cramped. That got me to thinking about the possibility of just mounting them on the transom. Sam went this route recently with the new Dipper 19 design. I wonder if the Zilla 25 could be adapted for that as well. The weight of the twin 20s would actually be less than your 60. But I do know what you mean about not liking the idea of twins in theory. I kinda feel the same, but I know that motors fail, and where I live, you need to be able to get yourself out of sticky situations. It seemed to me like 20 hp would move 5800 lbs along fine at displacemnt speed, and then you could always drop the second one down to get more power when wind and tide are against you. Maybe if they could be transom mounted, you could bump up the power to twin 30s? I don’t know… just all theoretical right now. I’m in the process of building a new house here in Skagway, so I’m not going to be building a boat anytime real soon. Would be great to see you up here. Sam was up here a few years back doing sea trials for a new Sockey 42 that he had just built and was delivering to the new owner in Sitka. He looked me up (since he built my Oarling), and took me aboard. I also visited his shope a couple years ago when I was down in Olympia. Also… I was wondering how comfortable she is in a chop. The tug design is pretty flat on the bottom. I know that keel really helps matters, but I wonder if a sharper deadrise design is better suited to my waters. Curious to hear about your experiences. She’s has a surprisingly easy motion in a chop. With the flat bottom, I really didn’t expect that. I think the 9 foot beam and the weight of the boat smooth out smaller waves and push through larger ones. Quartering into larger waves throws a lot of spray so you’ll want to keep the windward door closed. I had her out in 6 foot waves a few weeks ago and she handled really well. The outboard never cavitated, I think because it’s so far forward of the stern. Oh, I think the round stern is one of the best features of the boat. If you want to mount motors on the stern I’d just buy plans for a boat with a transom and save all that redesign work. I agree that the round stern sure is attractive. But finding a full displacement boat, designed for outboard power, is not easy. Most are designed around inboards. That’s very true. This is a really underserved niche. I guess my point is, I felt like I was modifying the design as much as an amateur could do and have any reasonable chance of success. Changing it even more increases the likelihood of making a boat that doesn’t work well or is dangerous to use. The risk just doesn’t seem worth it to me. Devlin’s Surf Scoter 26 (http://store.devlinboat.com/surfscoter26.aspx) might fit the bill pretty well though. Wide transom, and designed to have the weight of the motor in the stern. The Bluejacket 24 (http://www.bluejacketboats.com/bluejacket_24.htm) is semi-displacement and designed for a 50 HP outboard. The Redwing 26 (http://www.cmdboats.com/rw26.htm?cart_id=69b93e6bf556f4a9fb073f69520b8d02) is very nice too, and runs on a 20-30 HP outboard. All real good points Tom… and well understood. You gotta figure that these designers know a little something about their craft and designed them a certain way for a reason. I’m sure they must hate all of us “tinkerers” who think they know better 🙂 I suppose moving all of that weight, designed to be in the middle of the boat, back aft is not an easy trick when you don’t have much bearing surface to support the weight. But then if you increase the surface area back there to hold the weight, how do you prevent the inevitable drag that will kill efficiency? That is something I have always wondered about when it comes to Sam’s “semi-planing” Scoter designs. Seems like lots of tail draging in the water. But I do think they are a nice design, and I especially like the “Black Crown” design that appeared in Sam’s original design catalogue (he doesn’t have it on his site). It’s 24.5 by 8.5 and seems a bit more “displacementie” than the Scoters. I’m very familiar with the Redwing 26, and the pages of my study plans are showing lots of wear 🙂 I have e-mailed Karl a few times to talk about the possibilities. But every time I consider the design, it just seems a bit fragile for these waters. It would be perfect for the Intra Coastal, but I’m not sure about the Inside Passage. The “Puffin 28” seems more like it, but it’s designed for inboard power. I am not familiar, however, with the Blue Jacket, and will be sure to give that a closer look. But it too is a “semi” design and I wonder about the drag. I really like many of Benford’s designs and it seems like there are a few that would lend themselves to outboard power… particularly the “Deadrise 26 and 27”. But again it would take some monkeying around. Ah well… lots of pretty designs out there to consider. And I think your variation on the Godzilla 25 is perfect. I recently found your blog and it is wonderful. You roam far and wide, often singlehanded, and it is very inspiring. I recently built and launched a Devlin Black Crown in Bellingham so we share much of the same cruising waters. I also see your brother’s boat anchored off Boulevard Park often. You don’t seem to have posted lately so I hope all is well. Let me know if you want to get together and talk boats when you make it to Bellingham again. Wowah I like your blog, due to the fact that I just started to build my own 27′ Motorboat it’s always a pleasure to see people who already realized their dream of a own boat. Can’t wait to go through the whole process as well 😉 Kind regards from Germany! Your blog and boat are beautiful. 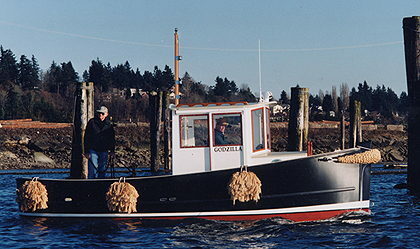 I will be moving to Anacortes soon and have been considering building your boats little sister, the Godzilli. I want to build a boat to cruise the Anacortes waterfront and take day trips into the San Juans. I haven’t found any information about how seaworthy this boat is. I don’t plan on going out in rough weather but would want a boat that I could get back in if the weather got rough. Any information would be appreciated. I have also long admired Coot and especially Tom’s adventures on her. He seems to have gone everywhere on his little ship. I have built a Devlin 30′ Black Crown. Solstice is moored near our home in Bellingham. I would enjoy hearing about your aspiration to build your own boat. If you send your email address I could send you some photos of her. Thanks for the nice words! Sam Devlin used his Godzilli as a harbor workboat for a long time, so he’d know more about the seaworthiness of it. He’s good at answering letters and phone calls. My boat is OK in rough water, but it pounds some in larger waves. It’s basically flat-bottomed. I’d say they are both pretty safe though – water that comes over the rails just runs out through the stern, and the motors are tucked up enough so they shouldn’t get pooped. I love my boat, but you need to understand it’s slow! Work out some distances at 5 miles per hour, and see if you might want to make something a bit faster, especially if you want to head over to the islands. Let me know if you have any further questions. Hello, will you share a download of what you use to create the schematic?